This dance hall number which dates back to the 1830’s is still as popular today. Made famous by the Moulin Rouge in Paris this number is still performed to audiences across the world. Considered in its day to be a scandalous dance with its cheeky and provocative moves and the ladies throwing there skirts above their heads to reveal their frilly laced behinds ! The Cancan makes a great dance experience to have with all your girlfriends, you will learn chorus line kick routines, famous can can tricks, the rond de jambe and with a clever cheat you will be able to attempt the most daring move of the can can the finale jump splits! 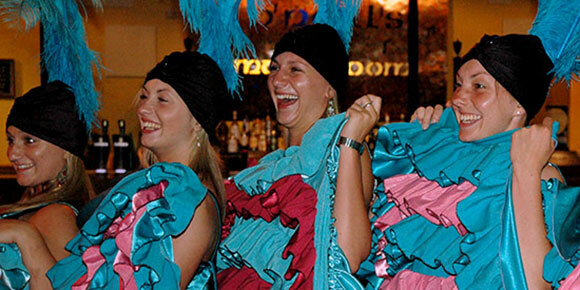 You will get a chance to try on the Cancan skirts and put all the moves together into your own rendition of this boisterous Cancan dance. Orpheus in the Underworld by Offenbach ( Cancan music). Cancan skirts will be provided for you to use during the workshop. Ideas on what to wear: soft, flat shoes, trainers, black tops or basque tops look great with the skirts. Cameras so you can capture all the fun, good set of lungs for all the Cancan screams.